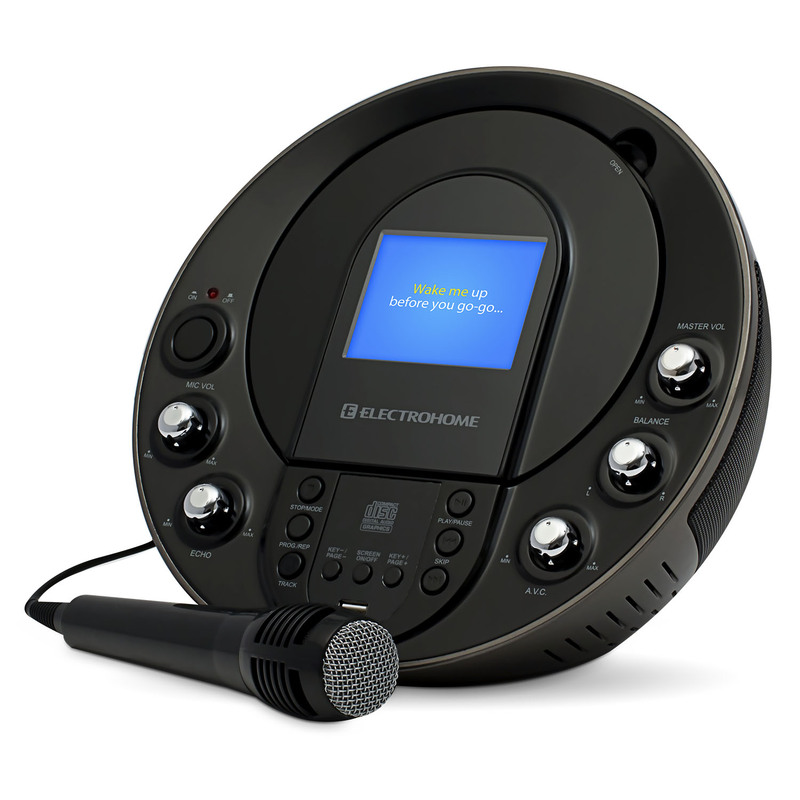 Electrohome brings you a stylish karaoke system you can enjoy for hours.Sing along while reading on-screen lyrics with this all-in- one karaoke machine. This system plays CD/CD+G, has a USB port to play MP3 and MP3+G karaoke music and a 3.5mm aux input to stream online karaoke from your smartphone or tablet. Combined with high performance stereo speakers anyone can sing like a pro! A durable handle makes taking this machine to the party easy and superior good looks with modern detailing will make you want to leave it out after the show. Read and follow the karaoke lyrics on the 3.5” video screen or connect to a TV for a larger view using the included RCA cables. Control Control the tune the prerecorded music plays in to match the vocal range you are most comfortable singing. With this feature you don’t have to strain your voice so you’ll always sound great. Just how does that other singer get that rich, full tone in the performance? The secret is the Digital Echo Control feature which lends a vibration through the mic making your singing sound confident and more professional. When you’re in the car you sound just like your favorite artist but then, when you are in front of a crowd you forget the next line! Never find yourself there again with Auto Voice Control (AVC) Singing Coach. This feature will sense that your singing has tapered off and the prerecorded vocal back up will fill in the blanks! This will prompt you to remember the next line just like the song in the car did. Once the karaoke party warms up there is no stopping the need for more microphones. With a second microphone input, singing in groups of two or more adds to the fun (additional mic sold separately). Even if this is your first karaoke machine, you will already have a catalogue of popular songs to choose from. The included multiplex disc contains two versions of each karaoke song – one version with recorded vocals to help you learn the words and one without. This system is all you really need to throw a great karaoke party. Even though it is only April, I ordered this for my grandson's Christmas present. Being retired, and on a fixed income, I have to start very early and buy a little at a time throughout the year. The product is still in the box, but I expect it to be a real hit in my grandson't home. I ordered this product over the Christmas holidays. It was supposed to come with a bonus microphone but was missing when I opened the box. I called customer support right away and spoke with the nicest customer service rep who immediately processed an order for the missing microphone which was shipped out the next day and received by me with no issues. I love the product. It sounds great, is easy to use and am hoping my nieces love it when they visit next. I have no problems with them learning how to use it because it's very operator friendly (which I love). Also want to mention the price. Got it on sale for 69.97 and that was the BEST of all. LOL Thank you for the great service and product! doorstep when they arrived and was the hit for the weekend. 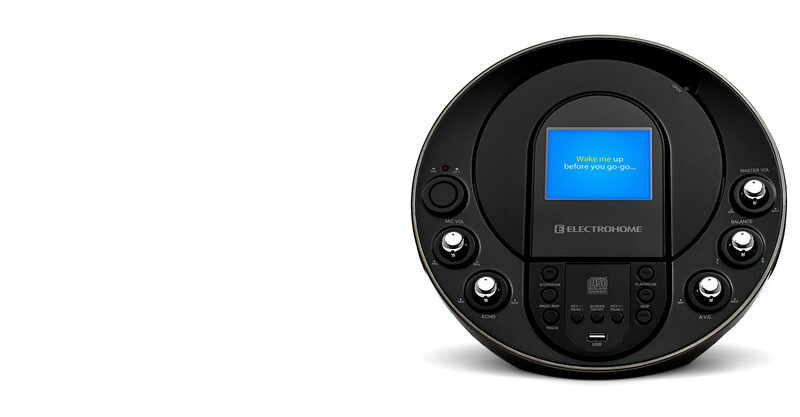 <i>Verified purchase from Electrohome trusted store</i>. Nice little Karaoke machine. Good value for the money I paid. Great product my girls live it so much fun!! I enjoy it!! My daughter loves it. Wonderful Christmas gift. Wonderful product, it was the hit of Christmas. kids, microphones are good, a little heavy. Good Quality. My granddaughter loves it. Hooks up easily and the kids love it! big screen. Overall a positive unit. I truly recomend it, is perfect, I give it a 10. Absolute perfect. Wonderful machine! Made a great gift that was used & loved by many.